Howdy, chatters. Welcome to another thrilling addition of our weekly two-hour conversation about all things Mizzou. Do you see Ramey coming to Mizzou? Or do you know when he might make the announcement? Ramey's father did an interview with a Louisville website/radio show on Wednesday and said his finalists are Louisville, Missouri, Oklahoma State and Texas. Mr. Ramey has given a couple interviews to Louisville media outlets in the last week or so and hasn't talked to outlets that cover Mizzou to my knowledge. (And not for a lack of trying on the media's part.) Interpret that as you will. Texas and Louisville have recruited Ramey for a long time. Obviously he was committed to Louisville before Rick Pitino was fired, but Chris Mack has picked up the recruitment and seems to have made Ramey a priority. I'm not into recruiting predictions, but instincts don't tell me he's coming to Missouri. I wouldn't be surprised if there's an announcement within a day or two. Is there any status update on Jim Sterk's lawsuit with Ms. Staley? Not to my knowledge. I've reached out to Staley's lawyer and haven't gotten a response. Sterk is not allowed legally to comment on the matter publicly. FYI, Back to the Future is on HBO Comedy. Brilliant! Any idea when we should expect J'Mon/Frazier to get drafted if at all? Moore is projected as a mid- to late-round pick, while Frazier is probably a late-round pick. Rounds 4 through 7 are Saturday. I would think both will be Saturday picks. 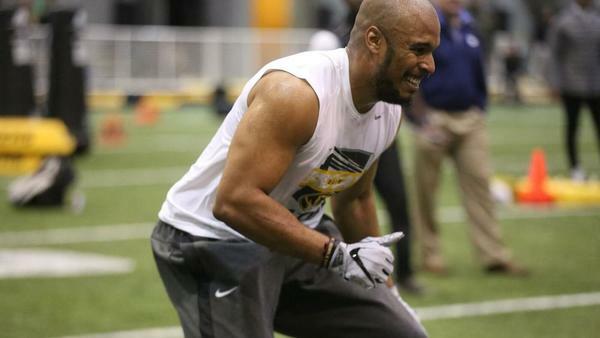 I wrote about Frazier and his path to the draft in today's P-D.
stltoday.com: Defensive end hopes to carry on Mizzou's tradition of sending pass-rushers into the NFL. Dave, I seen on your twitter account and others that CM has offered several HS jrs scholarships. How many has he offered? They've offered more, but those are some names that should be familiar locally. Louisville had to vacate wins and pay a financial penalty. The program wasn't hit with any other sanctions that will impact the program further, although the federal investigation is still ongoing and it's uncertain how the NCAA will enforce sanctions based on any findings related to the FBI probe. But when he took the job Chris Mack made it clear he didn't have any concerns about that situation. There was nothing illegal about Mack saying he wasn't recruiting Ramey. Coaches are allowed to confirm whether or not they're recruiting a certain player. From what I understand of the situation, there had not been contact between Mack and the Rameys when he made that comment, and only later did the family reach out to Louisville and started talks with Mack's staff. With Ramey seeming unlikely and Hinson looking good (hopefully) where do you see Mizzou going with their last scholarship? Do you think they'd still take Dru and have 2 Smiths sitting out next year? Martin wouldn't have Dru Smith on a visit unless they were serious about signing him as long as there's a scholarship available. Having two players sit out next year isn't ideal, but it would pay off in 2019-20 when the team has to replace Puryear and Geist. This coming season was always going to be a bit of a transition year. Missouri went all in on Ramey and there doesn't appear to be backup options from the high school level. Getting the Smiths, plus Hinson if he indeed commits, would make for a pretty solid class. If mizzou does not get Ramey (seems like we won’t at this point), who do you think we get to round out this class? I know Hinson had a good visit and dru Smith is in campus at some point this week but if we get Smith that’s two guards who have to sit out. Who do we look at for imedtiate guard hel? Besides Ramey do you know of anyone else they are recruiting? See the previous answer. There doesn't appear to be any other guards on the radar, at least none that have popped up publicly. Any chance of having Dooley on the pod? Ha! Doubtful. I've been waiting four months to get some time with Dooley for an 1-on-1 interview. Still waiting. Mizzou football mostly goes in hiding from April to August. Do you think the Mizzou softball team will be playing in the SEC tournament? I think they are in 12th place right now with 6 wins and the two teams behind them have 5 wins. And I think Florida is the only SEC match left before the tournament. I sure hope we get in since it will be in COMO. Mizzou is in serious danger of missing the SEC field. At 6-14, the Tigers are percentage points ahead of Kentucky and Ole Miss for 11th place in the league. (Top 12 teams make the tournament.) But the Tigers have only three games left - all against first-place Florida. If the Tigers get swept and finish SEC play at 6-17, they better hope Kentucky loses enough games against Tennessee and South Carolina or Ole MIss struggles against Arkansas and Georgia. What are the chances Illinois State wins in any sport this year? Hmmm, wrong chat, my friend. Though I'm a fan of Dan Muller. Interviewed him this week for an upcoming story. Where does Karissa Schweizer rank historically in MU athletics... the obvious talents like Askren, Sundvold, Wherli get more recognition because of their sports, but she's got to be near the top, right? In terms of individual sports - not team sports, per se - she's the most decorated Mizzou athlete of all time. It's hard to measure her career against the likes of players from team sports, like Kellen Winslow or Steve Stipanovich or Max Scherzer. All lists are subjective, but if I had to rank the greatest Mizzou athletes from my time covering Mizzou athletes (circa late 1990s), I'd have Schweizer at or near the top with Ben Askren, J'den Cox, Chase Daniel, Jeremy Maclin, Max Scherzer, Christian Cantwell and Justin Smith. Sophie Cunningham is getting closer. Both Robertson and Barnett have a chance to play professionally overseas. How lucrative is an international career compared to the G. League? Much more. G League base salary is $35,000. Of course, if you're in the G League that means you're one step away from joining an NBA team with the potential of earning a bigger contract. Many college players have made a good living playing long careers overseas. I don't work for one of the recruiting sites, so I don't really get into the weeds with 2020 prospects. I'll gladly write about them if they come to Missouri and play here in college, but I've never been invested in covering the daily happenings of recruiting. Just not my niche. Its a mute point now and I am sure that Lock had advice from people a lot smarter than me but I have two observations. Going in the draft this year and getting drafted lower could give him a better platform to succeed - better team not desperate for immediate help (ie Patriots) might draft him. And thinking he will learn more in the new MU offense about Pro sets, etc than he would in 3 months of preseason prep for an NFL season is wishful thinking IMO. Thanks for the chat. I think he made a wise choice and can position himself to be the top quarterback prospect in 2019. Teams don't really have the patience to sit a first-round pick for a full season like they used to, so if he's indeed one of the elite 2019 draft prospects he'll be picked to play sooner or later. At this point, who knows who'll be in the market for a QB next year to groom for a bit or start immediately. Pittsburgh? San Diego? Arizona? Baltimore? No Chelsea Thomas on the all time list? She'd probably be the top choice from the Earleywine era, if not Rhea Taylor. Say the class ends with Hinson and D. Smith. Could next season potentially be even worse than this season on turnovers and ball handling? I'm not sure about that. A lot of the turnovers this past year came from big man bobbling passes. Remember, Timon and Jontay were 2 and 3 on the team in turnovers. There's a good chance three of the team's five turnover leaders won't be back next year. Geist will work on his handles. He worked incredibly hard last offseason on his jumper and it paid off. The staff fell for him last year because he lived in the gym. If they don't sign any more guards for next year, it's going to be a lot of Pinson and Geist handling the ball. What are your thoughts on Steve Bieser and the culture he is creating for Mizzou baseball? I have been really impressed since his opening press conference. This team always seemed to kind of sleepwalk through midweek games in years past, but Bieser really seems to have them focused at all times. And it was nice to see big crowds during the Vandy series and the game with Missouri State. Perhaps people are starting to take notice. I'm very impressed. He doesn't have the talent of top teams in the SEC, but when at their best, the Tigers are sharp and intense. They play really clean baseball. The pitchers have great control. The defense has been outstanding. There's not much power in the lineup but they walk a lot and give their teammates chances to extend innings. Culture is the right word. It's overused in sports but not this case. I've been especially impressed with how Bieser embraced MU's It's On Us student group and how he's turned his baseball team into the athletic department's unofficial face of a very important organization. I know Mack Rhoades is an easy target, but I think he made a really strong hire. The Athletic has been adding team specific college football writers lately. Does Mizzou have enough of a following to be added? If so, is that something you would consider? I subscribe to both the Post and The Athletic (and PowerMizzou) so I don't really care. I just find The Athletic's model interesting. I would imagine you tire of sharing the sports section with the likes of The Alibi and Christ. It's not appropriate for me to talk about another company on my company's forum. I just hit my five-year anniversary at the Post-Dispatch and am very happy covering Mizzou for my hometown paper. I've been offered multiple chances to leave the P-D the last five years, but I believe in this paper and believe in our commitment to covering Mizzou. What are the chances Mizzou baseball CWS? What about hosting a regional? Do the top 16 host a regional?